View More In Pitcher Water Filters. The PropurTM Traveler system is small in size for portability and is great for use in tight spaces. The system requires no electricity to provide reliable water filtration just about anywhere whether at home, office, vacation, camping or college dorm! 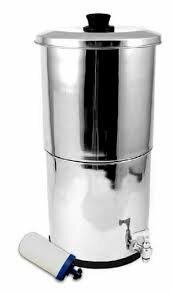 Each container is made from one piece of high quality polished stainless steel for lasting durability and attractive appearance. The system was created using a compact and portable design to produce ideal water filtration for indoor/outdoor daily use and for emergency preparedness. Just grab it and go! Works with just about any water source including tap, lake, river, stream, pond and rain water. The traveler comes equipped with the new ProOne® G2.0 5" filter. Height: 17" Nested Height: 9.5" Diameter: 8"
If you have any questions about this product by Propur, contact us by completing and submitting the form below. If you are looking for a specif part number, please include it with your message.